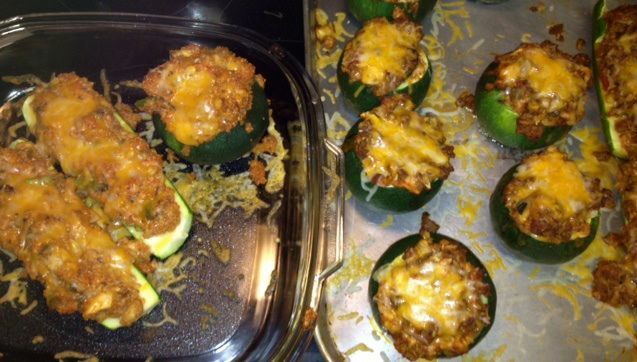 I grew up eating my Nana's stuffed peppers so when I saw this recipe for stuffed zucchini I was definitely intrigued, especially since zucchini is one of the few vegetables everyone in my house will eat without complaining. 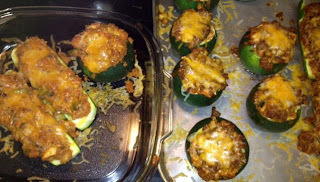 But, since I can't leave well enough alone, I decided to make a healthier version of stuffed zucchini. 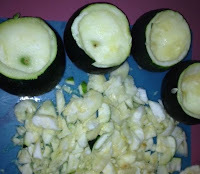 My first dilemma though was it was going to be a total pain in the a** to stuff cut rounds of zucchini. 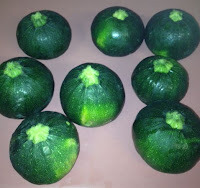 Then on a trip to the farmers market this weekend I discovered these little beauties - the farmer called them Bell Squash - but really they are just bell shaped zucchinis! Perfect to just cut the tops off and stuff! I also decided to make two versions of the recipe - a healthier meat version for the kids and a vegetarian version for myself. to bulk up the filling. The most obvious way to make the meat version healthier is to cut out how much ground beef I used. 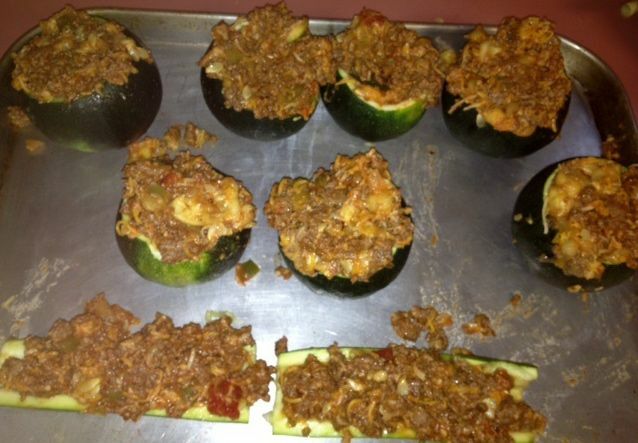 I read through the recipe twice to figure out what she did with all the zucchini meat she cut out of the zucchinis. Why would you be wasteful and not use it? So I cut the amount of ground beef in half and used the extra zucchini meat to help bulk up the stuffing. Also, two cups of shredded mozzarella cheese? No. I used one cup of a lower fat colby jack blend - less cheese but more taste. For my vegetarian version, I skipped the 90% lean ground beef altogether and instead used an equal amount of pre-cooked quinoa. I also chopped up some asparagus I had in the refrigerator that needed used. Next time I think I'll also add in some diced cauliflower. Yes, I realize the cheese is the only thing keeping these from being vegan. I'm OK with that. liked saying they were eating zucchini boats. I had a lot more stuffing than I anticipated so I pulled a couple regular zucchini out of the refrigerator and sliced them in half, scooped them with a spoon and made little boat shapes out of them to stuff. I didn't pre-cook the zucchini because I didn't want it to get soft or squishy. Mine only needed 15 minutes to cook ( everything in the stuffing is cooked so really you just need to heat the zucchini through). Yes - they loved them. OK, maybe love is a little strong. But all six kids ate them and no one complained! That is a successful recipe in my house! I served them with a salad and cup up watermelon (also from the farmers market) - a perfect summer meal. Using a bit of olive oil, saute diced onion, green pepper and minced garlic. Add in diced asparagus or any other vegetable you choose. With just a minute or so left, add in the zucchini meat to heat through. Remove from heat and place in a bowl. Add in a half jar of marinara sauce and a 1/2 cup shredded cheese. Stir all together. Scoop into zucchini bells or boats. Bake at 350 for 15 minutes. Top with a dash more cheese and heat until cheese is melted. a good use for zuchnni. thanks for the veg version, too.